FORT WAYNE, Ind. -- The Fort Wayne TinCaps recently turned heads with the debut of new home white jerseys and an alternate green jersey for Thursday home games, and they aren't done yet. As part of the celebration of their 10th season at Parkview Field, the TinCaps are introducing new, additional brand marks. The new marks, which are an extension of the team's brand, have been incorporated into new batting practice tops, batting practice hats, and road jerseys. "Heading into our 10th season we had already established the TinCaps brand with the team's name and primary apple logo," said Michael Limmer, TinCaps Vice President of Marketing. "What we were trying to do, with our friends from Sky Design (the original designers of the TinCaps brand marks in 2009) was to extend the brand, not replace the marks that people have come to know and love. We found a way to add to the fun in ways that express the TinCaps brand in a colorful way." While the team's primary apple logo and "TinCaps" wordmark remain, the TinCaps have added a primary road wordmark that will be featured on grey jerseys with red sleeves. "Ft. Wayne" is written in a cursive font and is candy apple red in color. The letter "F" resembles an apple, with a stem and leaf at the top. In a similar fashion, the team's new batting practice, or BP, tops are charcoal with grey sleeves. The BP tops say "TinCaps" across the chest in that same candy apple red cursive style, only with the "T" appearing like an apple with a stem and leaf. The new BP hats showcase a new secondary hat logo with "Ft.W" in candy apple red. On the batting practice hats, the "W" has the look of an apple. "What we were able to do was provide a contrast to the hard edges of our tin lettering, drawn from the apple logo's tin cap, and create a script, a more flowing font, from the apple imagery," Limmer said. "We imagined the curves of the apple peal forming 'Ft. Wayne', 'Ft.W' and 'TinCaps' and the folks at Sky Design were able to make that happen in a really remarkable way." Since rebranding from the Fort Wayne Wizards to the TinCaps when moving into Parkview Field in 2009, this is the first time the team has updated its jersey and hat designs. The new home white jerseys are similar to what the team wore for the last nine years, but no longer includes dark green pinstripes. The TinCaps also have added an alternate home hat that has a white front, with the apple logo in the center, and a dark green bill and back. Fans can purchase the team's new jerseys, hats, and more gear at The Orchard Team Store at Parkview Field, as well as online at TinCaps.com. 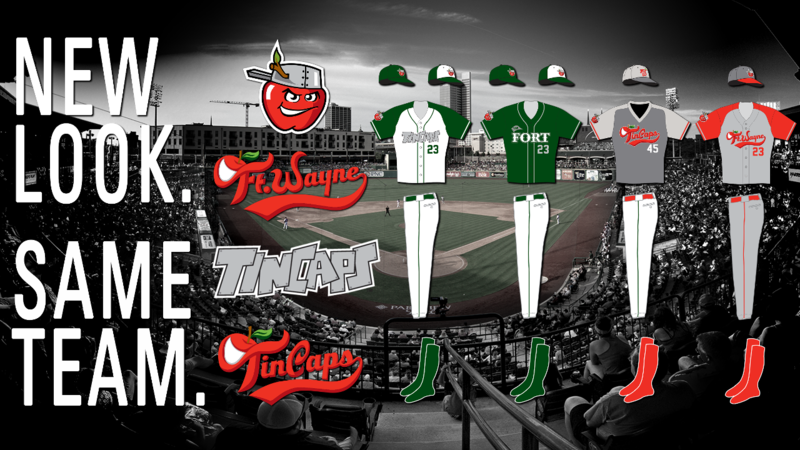 "We are excited to inject more candy apple red into the overall color scheme of the TinCaps brand identity. There's so many more directions we can take things with these new ways to express the TinCaps brand and identity. We certainly are not abandoning our foundational colors of dark green and tin, but this gives us more options and continues to use our primary logo of the TinCaps apple as the center piece of our extended brand family."